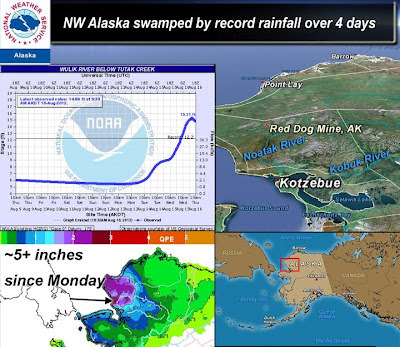 Roughly one third of the annual precipitation has fallen in Northwest Alaska over the past 4 days! 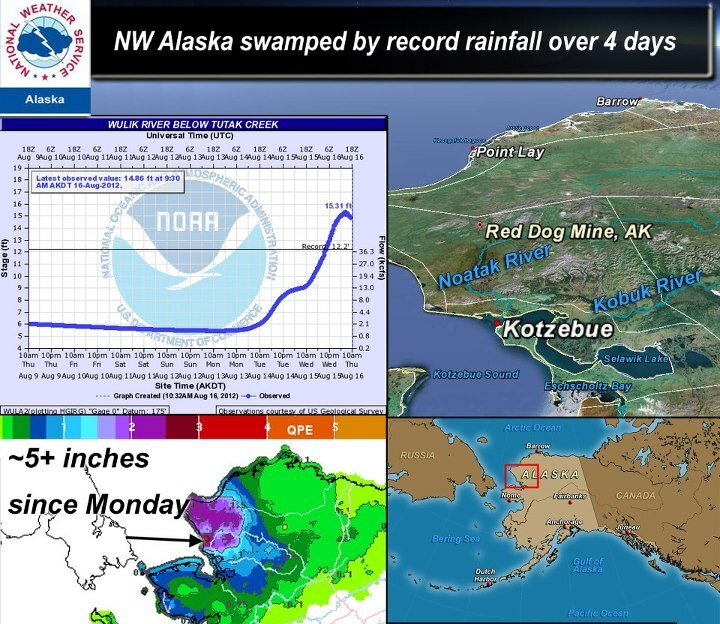 3.5 inches of rain at Kivalina, 2.5 inches at Kotzebue and 5 inches at Red Dog Mine, a region where rainfall in excess of 3 inches over 3 days is a once-in-a-hundred-year event. The Wulik River below Tutak Creek crested at 6 A.M. this morning with a river level of 15.31 feet. This was the highest stage ever observed since the gauge was installed in 1985, and far exceeds the previous record of 12.21 feet set in August of 1994. Water levels in the area will remain high as additional rainfall of 1 to 3 inches is expected in the next 48 hours. Water levels are also high in the village of Noatak. The system is moving east, and rises are expected on the Kobuk River, although the Kobuk near Kiana remains well below flood stage. Many of the rivers in this area do not have gauges, but based on rainfall there is significant potential for widespread flooding.